The 8-Inch xTablet T8650 is the first to market rugged Windows tablet with an integrated 3D camera. Other innovative features include a 2D barcode imager, fingerprint reader and 4G LTE. Clearly staking a claim as the leader in 3D technology innovation for mobile tablets, MobileDemand is expanding beyond the core rugged tablet hardware market and into high value systems for enterprise applications. MobileDemand, a leading rugged Windows® tablet provider, has designed an innovative 8-inch rugged tablet with integrated 3D camera. The xTablet T8650 is engineered specifically for the mobile workforce, where productivity is key and on-the-go performance is a must. The xTablet T8650 revolutionizes how businesses can create photorealistic 3D models of their subject as well as near field automatic measurements. The Intel® RealSense 3D rear facing camera, integrated seamlessly in to the tablet, captures 3D scenery and objects, overlaying virtual information into a live image feed. Users can capture depth-based images for applications such as volume dimensioning, measurements, scene capture and much more. The camera has multiple image sensors allowing depth sensing to see the world in 3D much like humans do. Combined with software that MobileDemand is also developing, it allows systems to understand what is seen. Three dimensional data acquisition with mobile devices is in the infancy stage. MobileDemand is developing software to acquire measurements, dimensions, object recognition, and 3D e-scenes using advanced computer vision technology and algorithms. These interfaces can be feed 3D data, such as measurements, to existing end-user applications in a variety of industries. 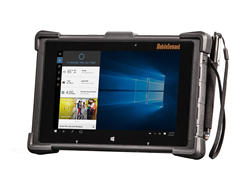 The rugged tablet with 3D camera runs enterprise-ready Windows 10 Professional, an operating system that gets more work done in less time, and is partnered with an Intel Atom X5-Z8550 processor, 4GB of memory and 64GB of storage. Other unique features of the rugged tablet include a high performance 2D barcode imager, fingerprint reader, 4G LTE, GPS, dual color cameras, hot swappable batteries, vehicle mounting, and much more. Accidents are bound to happen and the xTablet T8650 has built-in ruggedness to prevent damage to the device and to keep workers moving. For heavy duty applications both indoors and outdoors, the xTablet T8650 meets MIL-STD-810G standards with 4-foot drop survival and is IP65 sealed to withstand dust, rain and snow, allowing users to get the job done while protecting their financial investment. As a truly groundbreaking and innovative device, the MobileDemand xTablet T8650 will be featured in Microsoft’s keynote speech at the 2016 COMPUTEX Expo in Taipei. COMPUTEX takes place from May 31 to June 4. The xTablet T8650 will be available July 2016. For more information on the xTablet T8650 please contact MobileDemand by web at http://www.RuggedTabletPC.com or by phone at 319.363.4121. With a broad family of devices to choose from, MobileDemand is your one-stop shop for powerful, all-weather Windows® tablets and rugged Surface cases. xTablet ruggedized devices are the ideal tools for improving productivity and allowing mobile workers to make better business decisions at the point of interaction. They offer a high resolution, all-light readable touch screen, functionality of a full Microsoft Windows OS and the power of an Intel processor to deliver performance at a lower cost and enable greater efficiency and productivity in the field. Tablets start at only $595. Additional information about MobileDemand is available at http://www.RuggedTabletPC.com.